Foot reflexology, the best foot massage you can get in Singapore, is based on different studies that have been accumulated over the years. It is a form of alternative medicine called homeopathy and is based on the idea of a balanced energy. A licensed foot therapist should be familiar with all the concepts that guide the different schools of foot reflexology, which is founded on the studies of Dr. William FitzGerald, Dr. Joe Shelby Riley, and Eunice Ingham. The primary goal of foot reflexology in Singapore is to reduce stress and to enhance blood circulation so that the body can return to its normal state. To better understand the practice of foot reflexology, you need to know some of the theories it was based on. The theory of vital energy presumes that the body is given life through an energy called vital force or qi/chi. The existence of this life energy can be seen in the way an invisible force affects all animate and inanimate objects in the universe. Energies constantly interact with one another and this energy from very good foot reflex in Singapore should be balanced or else everything will be in chaos. From this belief, it is not too far-fetched to think that life itself is governed by the interaction of these energies. Any changes in the body is a result of reciprocal action between the trinity of life; body, mind, and spirit. If a person is to become healthy, the life force should make sure that all three are in harmony. Any disturbance can cause imbalance and will likely result in illnesses. Foot reflexology in Singapore aims to restore that balance by clearing up the blockages in the energy channels. This theory is supposed to explain the existence of pain and was based on the earlier Gate Control Theory of Pain by Dr. Ronald Melzack. It supposes that the origin of the pain comes from the central nervous system. The parts of the brain and the spinal cord work together to respond to stimuli from the body or the environment to create pain or let the body experience pain. If that is the case, then the central nervous system and all its parts are the regions producing pain instead of the damage to the tissues. The regions of the nervous system that are part of the matrix are the brain stem, thalamus, spinal cord, insular cortex, motor cortex, somatosensory cortex, prefrontal cortex, and the limbic system. The best foot massage clinics in Singapore cater to patients suffering from chronic pain by using this theory. Understanding how pain works and affects the mind and body can help during the treatment of the patient. If a patient believes that he/she will be okay after the treatment, then the natural response of the body is to feel less pain. Thousands of years ago, the Chinese have discovered the body meridians that serve as a network of energy channels. According to the concept, there are 12 major electrical pathways or meridians throughout the body that pass through one side to the other. A foot therapist in Singapore makes use of this concept to map out the energy pathways in a patient’s body so he/she can pinpoint health problems. Low currents along the meridians and even foot problems like calluses and corns, mean that there are congestions that need to be cleared. Foot reflexology utilizes the 6 main meridians found in the toes that are connected to the stomach, liver, gall bladder, spleen or pancreas, kidney, and bladder. This theory claims that the feet are a microcosm of the entire body, more so than the hands and ears. 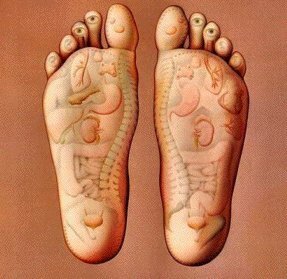 Microcosm means that the organs of the body are encapsulated or represented in miniature in your feet. This is the basis of the foot reflexology charts that map the different organs on the body in the soles, sides, top, and toes of the feet. If there are two organs, they will be present in both feet, while the heart can be found on the left sole. When a foot therapist looks at your feet, he/she will be able to make a diagnosis of your health because they contain all the information needed about the entire body. This theory is an important part of Chinese traditional medicine that explains the physiological functions as well as the pathological changes in the channels and collaterals and how they affect the organs. The channels and collaterals are made up of a total of 12 channels, 8 extra channels, 12 divergent channels, 12 channels of the cutaneous and musculo-tendinous region, and 15 collaterals. These channels and collaterals are the passages where the life energy and blood travel. The organs in the body all need the life energy so that the body can function normally. This theory is also used in other therapies such as acupuncture and acupressure to help a person control chronic pain. Some researchers believe that the cardiovascular system is regulated by neural or autonomic and humoral or circulating/hormonal systems, such as the baroreflex system which is responsible for stabilizing the pressure in the arteries. The nerve or neural systems include parasympathetic cholinergic and sympathetic adrenergic mechanisms. Which the humoral systems include renin-angiotensin-aldosterone, cetecholamines, atrial natriuretic peptide, vasopressin, and endothelin. Foot reflexology allows the stimulation of reflex areas in the feet and affect the internal organs when the neural pathways are cleared. The name reflex after all means an involuntary response to a stimulus. Foot reflexology can help improve the release of these hormones by initiating changes in the blood circulation in a method called humoral stimulus.